The Jessica Simpson engagement ring is stunning and as controversial as her whirlwind courtship and engagement. Fans and the media have been buzzing with questions about the ring design, its price tag and who paid the bill. Find out the details about Simpson's ring choice. Singer Jessica Simpson and her boyfriend, former NFL San Francisco 49er Eric Johnson, got engaged in November 2010. While most fans wish the couple well, some critics have questioned the timing of the engagement. Simpson and Johnson got engaged after a mere five months of dating. The engagement was also announced less than two weeks after Simpson's ex-husband, Nick Lachey, announced his engagement to Vanessa Minnillo. When the Simpson engagement ring's price of $100,000 was revealed, a number of celebrity news outlets reported a rumor claiming that Simpson purchased her own ring. The purchaser of the engagement ring was never revealed to the public. However, in a New York Daily News article, ring designer Neil Lane talks of Johnson selecting Simpson's ring. Simpson revealed a first public glance of her engagement ring to People magazine. She gave the media and the public a first look at her new engagement ring while promoting her clothing line at Dillard's department store in Kansas City. Simpson spoke of her happiness in the People interview: "He's the one for me right now!," says Simpson. She continued, "I'm very happy! I'm in a great place, and if right now could last forever, I'd take it." It appears Simpson and Johnson won't let any public criticism of their engagement and questions about the ring purchase get in the way of their happiness. The Jessica Simpson Engagement Ring is a three-stone red ruby and diamond ring by celebrity jewelry designer Neil Lane. The classic ring design features a five carat oval ruby as the center stone with a pair of two carat diamond accessory stones set in a yellow gold band. The three-stone ring style was particularly popular during Victorian and Art Deco periods. Simpson is not the only celebrity to pick the classic three-stone ring design. Celebrities like Salma Hayek, Madonna and Mena Suvari also chose three-stone engagement rings. Johnson selected a ruby because it is Simpson's birthstone and rubies are more rare than diamonds. 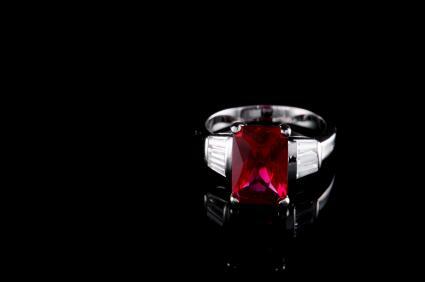 Rubies are considered stones of passion and love. Lane commented in a New York Daily News article on the ring, "Eric wanted the most romantic, beautiful, special ring for Jessica." Simpson's elegant engagement ring may inspire a new interest in ruby engagement rings and replicas. Fans looking for fashion replica pieces as well as fine jewelry can find many three-stone ring options. Shoppers may find rings similar to the Simpson ring design among fashion, antique and vintage-inspired pieces at various price ranges.